I’ve always loved making things for others, but there’s something so special about creating something for a baby. Even if they don’t know that someone made it for them, kids treasure things so much and seeing them bundled up in something I made just makes my heart melt. Last month, I was given the opportunity to make another baby blanket for someone and I’m in love with this design. 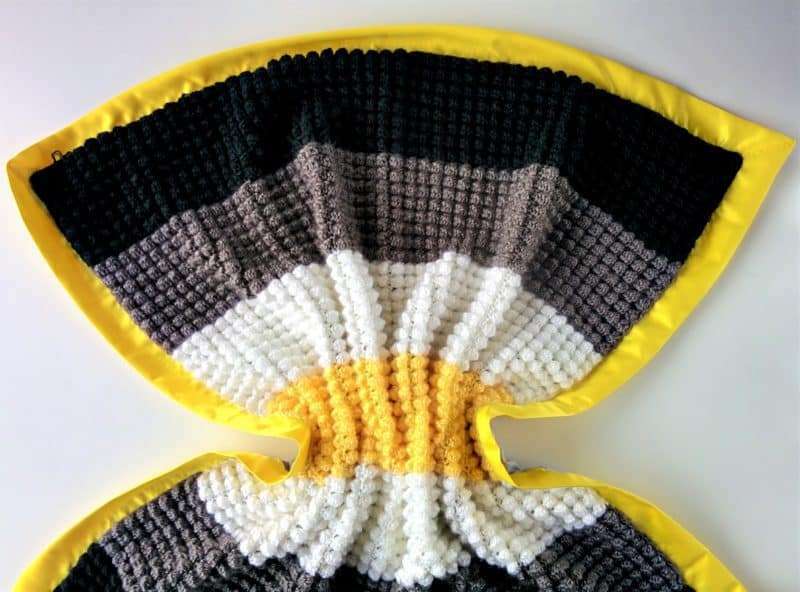 My aunt asked me to create something gender-neutral that would look nice in a black/white/gray room, but since she wasn’t looking for anything in particular, I had some fun with the stitch and a bright yellow accent color. The texture makes it look harder than it is because this is actually a very simple crochet blanket pattern. I call it the Bright Stars Bobble Blanket, and it just makes me happy! One of my favorite things when designing blankets is getting to play around with different stitches. 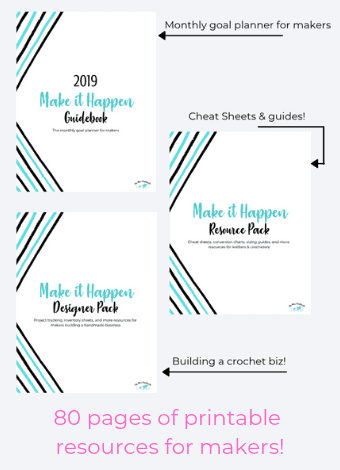 I have this book and I love flipping through it and picking of what stitch I’ll use next. 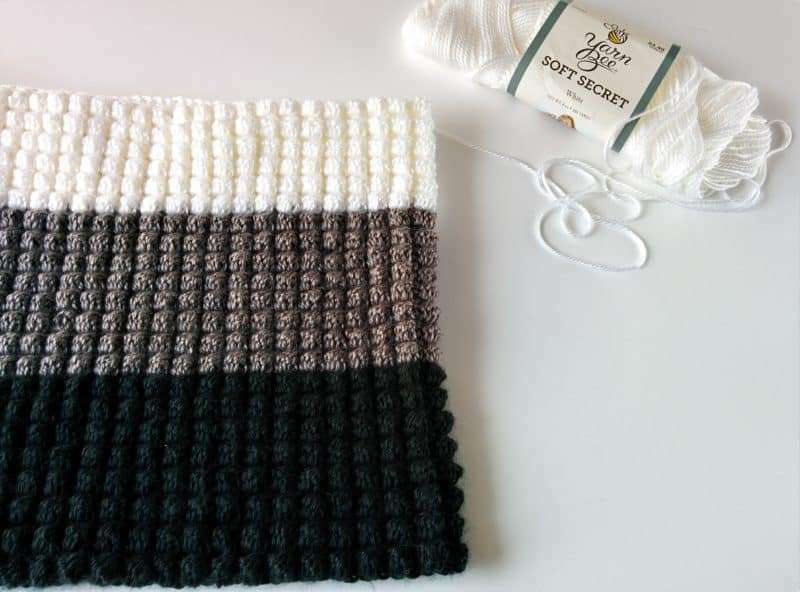 Even a simple crochet blanket becomes something a little extra special when you pair it with a different stitch pattern, and that’s exactly what I did here. I worked in bobbles and the entire blanket is just alternating rows of that bobble and single crochet. But it creates this amazingly textured, slightly heavy blanket that I can’t get enough of! Also, whenever I make blankets, I tend to use the same yarn. 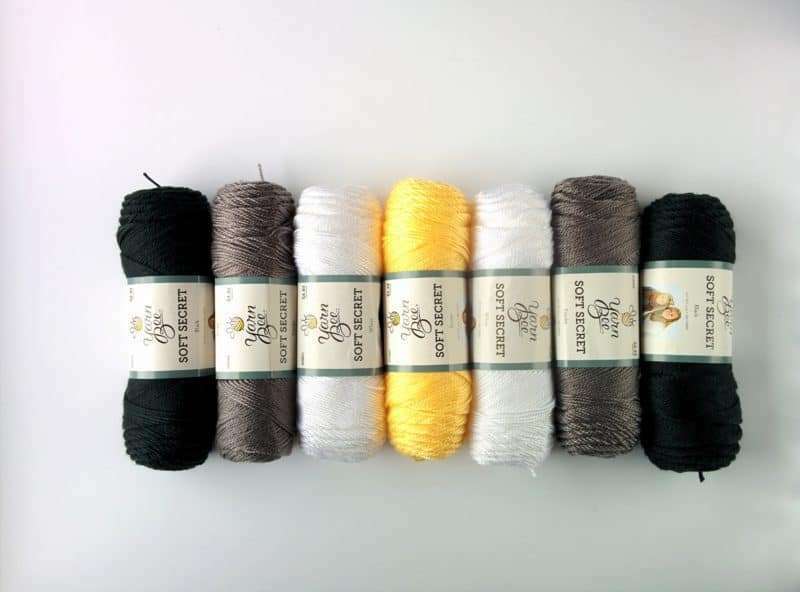 The Yarn Bee Soft Secret line from Hobby Lobby is my absolute favorite. It washes so well, it’s soft as clouds, and the yarn has this subtle shine to it that makes my stitches pop with even a simple crochet blanket pattern. You can get it in pretty much every color too, so this is definitely my go-to yarn for baby blankets. It’s the best quality acrylic I’ve found so far, and I have a whole other post talking about my favorite yarns for different projects. You can read that here. Row 1: Start by creating a long chain. For my 36″ baby blanket, I started with chain 105. Feel free to make it longer or shorter depending on how big you want yours to be, but any odd number is fine. Row 2: Turn and SC into each space, starting with the 2nd chain from the hook. You’ll have 104 stitches now. Row 3: Chain 3, and turn. Into the first SC space, work a DC4tog. To do this, work a DC into the space but only YO and pull through once. Repeat this into the same space another 3 times so that you have 5 loops on the hook. YO and pull through all 5 loops to finish. DO NOT CHAIN 1. SC into the next space. *DC5tog, SC 1* and repeat everything from * to * until the end of the row. Row 4: Chain 1, turn. SC into each space, first working into the top of the bobble and then the SC from the row before. Rows 5-112: Repeat rows 3-4 until the blanket reaches the height that you want. 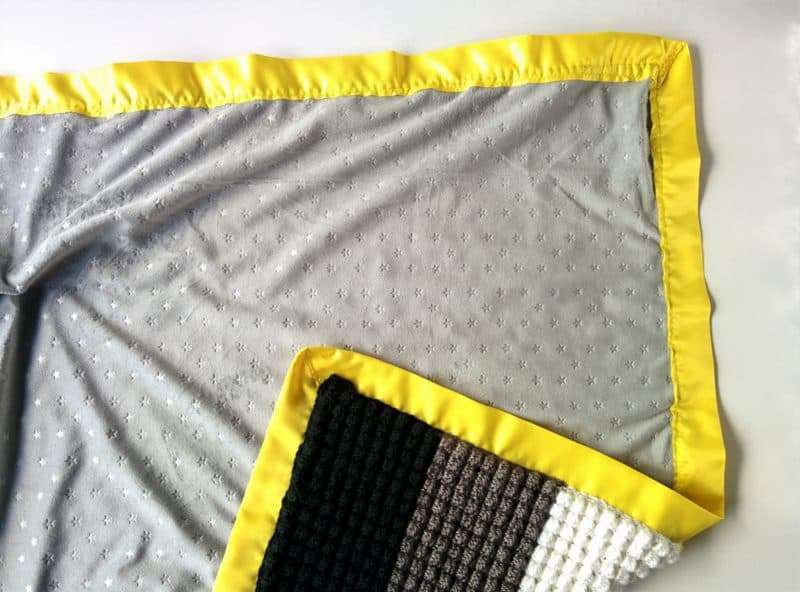 For this blanket, I worked until I had made the blanket 36″ tall so that it was square. End on a SC row. To make the border, I first worked a round of SC all the way around the blanket. At the end of your last black SC row, chain 1 and turn the piece so you’re working into the sides of the blanket and SC into the spaces there. Work until where the black section ends and change colors to gray, then continue SC-ing. SC all the way around the blanket, changing colors to match the stripe color, and bind off once you’re done. 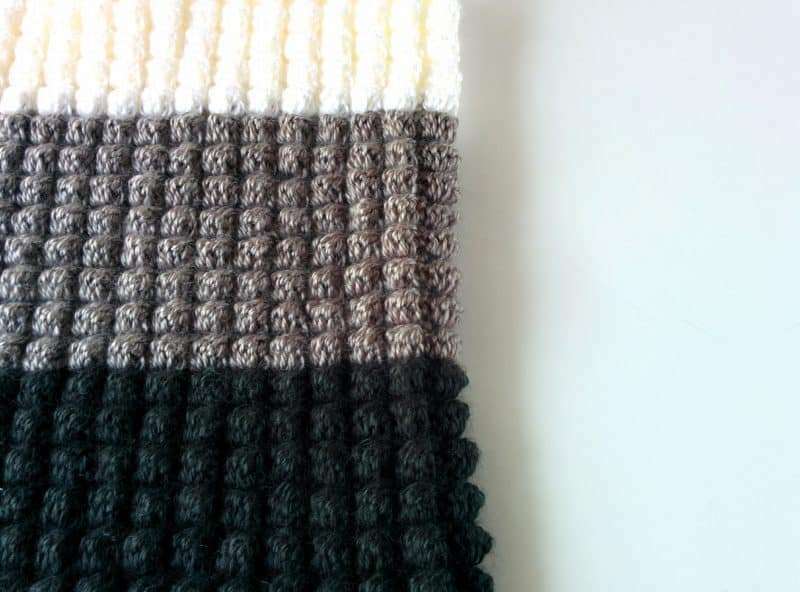 Then, use your tapestry needle to weave in the loose ends from the color changes and you’re done! 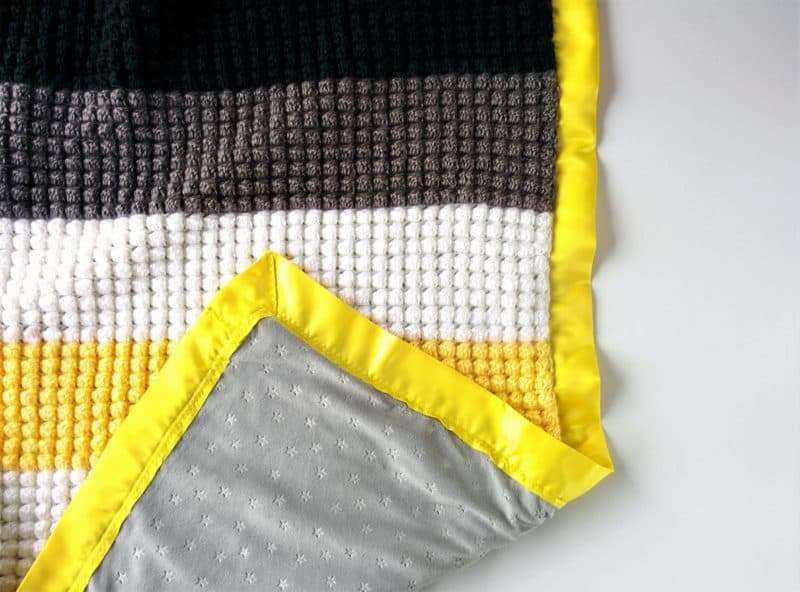 You can work the border all in one color (or skip it altogether), but I really loved the finished look it gave the blanket and how it neatened up all the edges. My favorite thing about any blanket I make is adding the fleece lining, and it’s something my customers always appreciate. 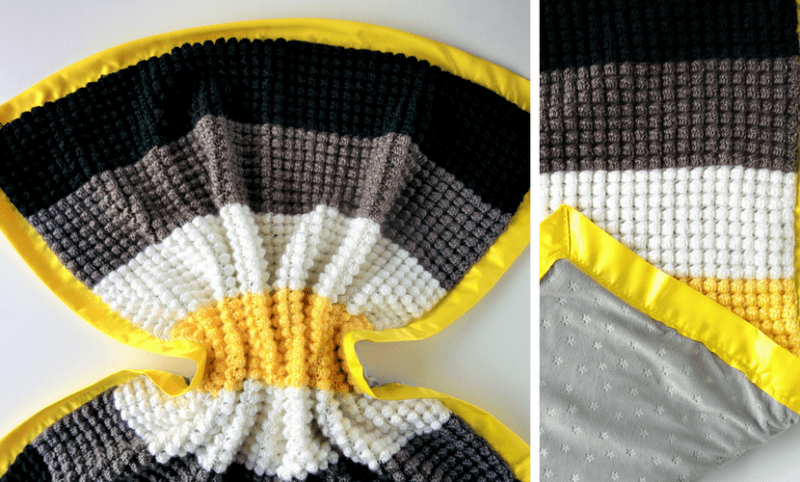 It takes a simple crochet blanket to the next level of snuggly! Basically, I cut a piece of fleece to the same size as the blanket. Then I used a sewing machine to add the satin binding to just the fleece, sandwiching the fleece between the flaps of the binding. Once I’ve worked my way around, I pinned the crocheted part to the fleece and sewed it together, pressing the bobbles down as I go so they wouldn’t get caught in the foot of the sewing machine. 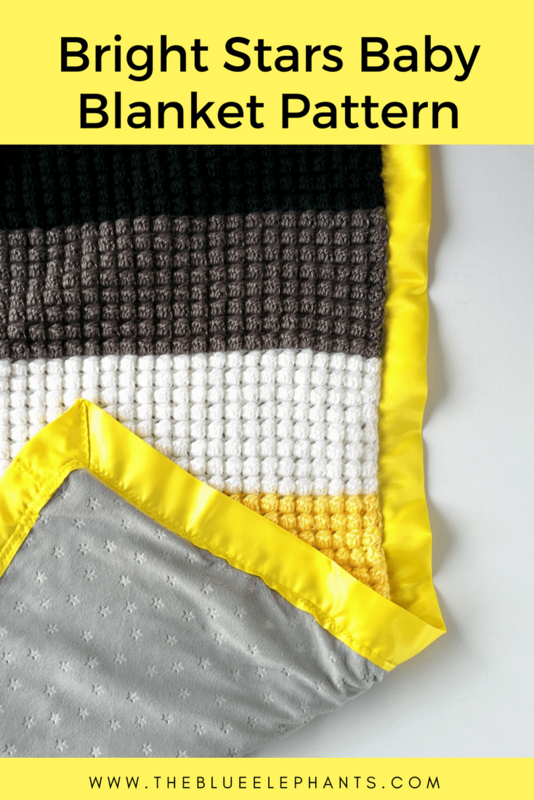 Then just trim off the excess string and you’re finished with the Bright Stars Bobble Blanket! It’s so satisfying to see all the bobble lined up perfectly! I did stop every now and then to make sure they lined up. As soon as you notice yourself placing a bobble that isn’t directly above another, stop and take a look at the row for a missed stitch. It’s easy to go back and fix it if you see it right away. 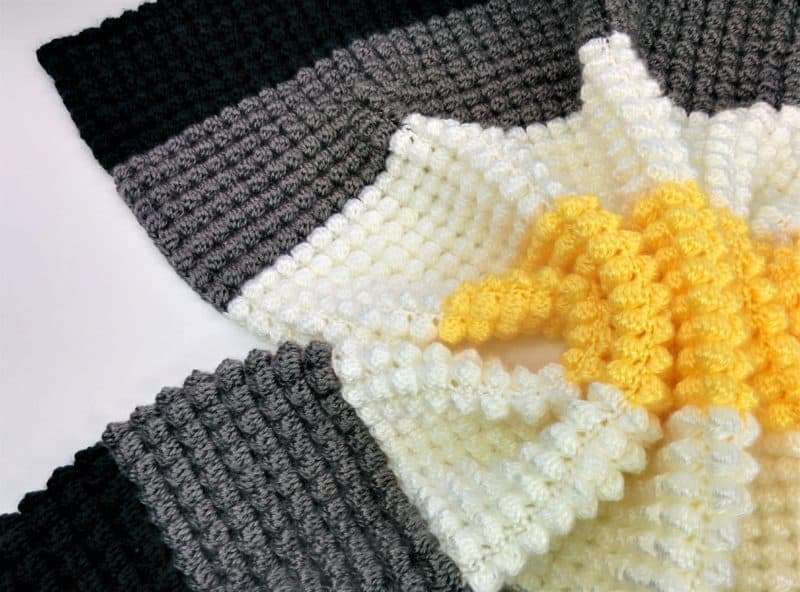 This is very simple crochet blanket pattern, and although it looks complicated, it’s really not. It’s a yarn eater though, but I think it’s totally worth it! 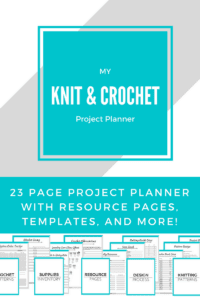 Baby blankets, or any simple crochet blanket, are my absolute favorite things to make; they’re really the reason why I can do this blog and work on creating patterns instead of going to work like a normal person. 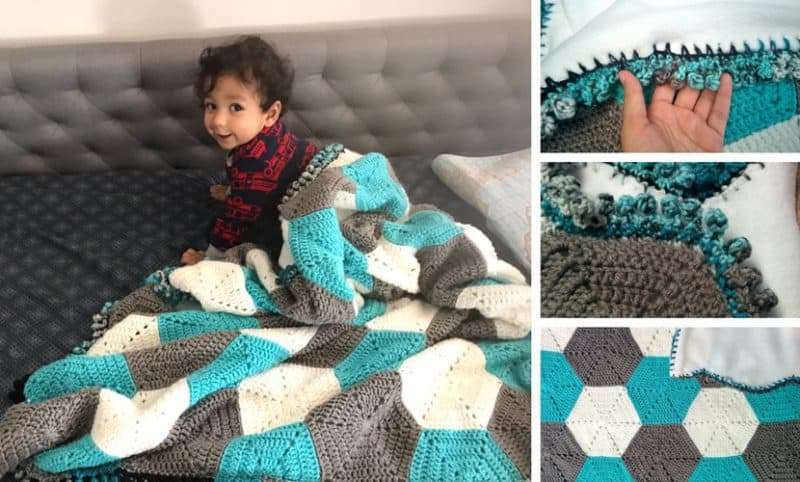 But the reason I love them so much is because I get to try out new ideas and crochet stitches, and I know that whoever the blanket is going to will love and cherish it. 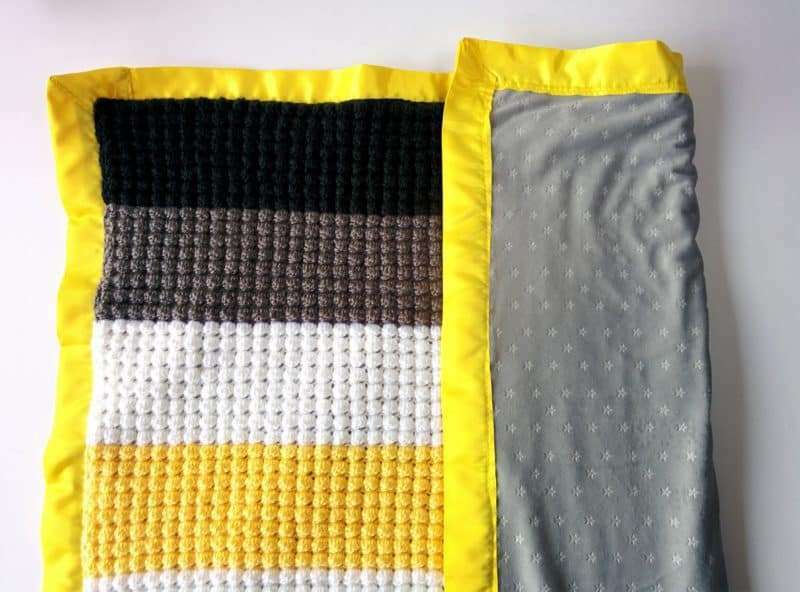 All the baby blankets I’ve made, gifted or even sold have become items that those kids cling to and find comfort in. It’s so heartwarming to see them holding onto the corners or laying down on them, all snuggled up. Seriously, how cute is this smile? ?